The Dallas Cowboys, defending NFL Champions, were 6-2 and had won six straight games after an 0-2 start as they hosted the Phoenix Cardinals on November 14, 1993. However, Head Coach Jimmy Johnson’s team would be without star QB Troy Aikman due to a hamstring injury. They still had the other key components to their offense in RB Emmitt Smith and WR Michael Irvin. They had also just picked up ninth-year veteran QB Bernie Kosar (pictured at right), who had only been with the Cowboys for four days after his abrupt release by the Browns, where Head Coach Bill Belichick said he had “diminished skills”. The Cardinals were coached by Joe Bugel and limping along at 3-6, although they were coming off a win against the Eagles. QB Steve Beuerlein had been benched in favor of Chris Chandler and RB Garrison Hearst, the highly-touted first round draft choice, held out and then went down with a knee injury six games into the season. Still, Phoenix had a good receiving threat out of the backfield in FB Larry Centers, a reliable possession receiver in WR Ricky Proehl, and the defense could be stingy at giving up points. There was a crowd of 64,224 in attendance for the late afternoon game at Texas Stadium. The Cardinals went three-and-out on their opening possession. Following the punt, Dallas drove 35 yards in seven plays with rookie Jason Garrett at quarterback. Five of them were runs by RB Emmitt Smith and Garrett completed a pass to WR Michael Irvin for 16 yards. Eddie Murray kicked a 44-yard field goal to give the Cowboys the early 3-0 lead. 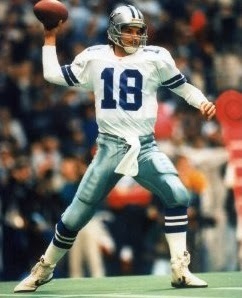 The teams traded punts and on the third Dallas series, Bernie Kosar entered the game at quarterback. He immediately completed a pass to Irvin for 14 yards and, after Smith was tossed for a five-yard loss, threw back-to-back completions to FB Daryl “Moose” Johnston for six yards and to Irvin for 18 to reach the Phoenix 32. Smith then ran the ball five straight times, the last on the first play of the second quarter for a four-yard TD. Murray’s extra point made it a 10-0 game. The Cardinals, who had done nothing on offense during the first quarter, generated three first downs as they advanced to the Dallas 45 on their next series. QB Chris Chandler completed three passes, although one that was called back due to offsetting penalties negated a big gain. The Cards ended up having to punt and once again Kosar led the Cowboys on a scoring drive. The big play was what started out as a five-yard completion to Smith out of the backfield that the great runner turned into a gain of 86 yards to the Phoenix two, breaking three tackles along the way. Smith couldn’t penetrate the end zone on two running plays, but Kosar threw to TE Jay Novacek for a one-yard TD and, with the extra point, the home team held a 17-0 lead. After a three-and-out series by the Cardinals, Dallas again advanced into Phoenix territory, but a fumble at the 28 negated an opportunity to add more points. Jason Garrett returned at quarterback for the Cowboys on their next series and the half ended with no further points scored. The Cowboys punted following the first possession of the third quarter, with Kosar again behind center. The Cards drove 47 yards in 11 plays, Chandler completed four passes, the longest to Ricky Proehl for 16 yards in a third-and-six situation, but after getting a first-and-goal at the Dallas five, they ended up having to settle for a 19-yard Greg Davis field goal. On the first play following the kickoff, Kosar fumbled and DE Reuben Davis recovered for Phoenix at the Dallas 19. The Cardinals capitalized three plays later when Chandler threw to Larry Centers for a 17-yard touchdown. Davis added the extra point and suddenly the visitors were only a touchdown behind the Cowboys. Dallas punted following its next series, but now it was Phoenix’s turn to give up a costly fumble. Chandler dropped the snap on the fourth play and DE Charles Haley recovered to give the Cowboys the ball at the Phoenix 39. Two passes by Kosar picked up 21 yards and, early in the fourth quarter, Murray kicked a 43-yard field goal to extend the Dallas margin to ten points. After a punt by the Cards pinned the Cowboys down at their one yard line, Kosar was penalized for intentional grounding while passing out of the end zone, resulting in a safety. Phoenix then took the free kick and went 30 yards in eight plays. Davis kicked a 47-yard field goal to narrow the Dallas lead to five points. The Cowboys responded with a long non-scoring drive that knocked time off the clock. It was all Smith, either running or catching short passes from Kosar, as Dallas converted two third downs. By the time the Cardinals got the ball back at their own 13 following a punt, there was just 2:37 left in the game. Chandler passed Phoenix into Dallas territory, but on a fourth-down play at the Dallas 41, FS Kenneth Gant came up with an interception and that was it. Dallas won by a final score of 20-15. The Cowboys had the edge in total yards (311 to 265) while each team generated 15 first downs. There were no sacks by either club. The Cardinals turned the ball over three times, to two suffered by Dallas. Bernie Kosar completed 13 of 21 passes for 199 yards and a touchdown with none intercepted. Emmitt Smith (pictured below), who was battling the flu, rushed for 80 yards and a TD on 24 carries and gained another 102 yards on four pass receptions. Michael Irvin also caught four passes, for 63 yards. For the Cards, Chris Chandler was successful on 27 of 46 throws for 214 yards and a TD with one intercepted. Larry Centers, who rushed for three yards on two carries, caught 7 passes for 59 yards and a touchdown while Ricky Proehl gained a team-leading 66 yards on six receptions. Johnny Bailey led the modest ground attack with 8 carries for 31 yards and contributed 6 catches for 34 yards. The Cowboys lost their next two games before winning the remainder and finishing atop the NFC East with a 12-4 record. They again advanced to the Super Bowl and won for the second straight year. The Cardinals finished strong with four wins in their last five games to end up fourth in the division at 7-9. Bernie Kosar started one more game before Troy Aikman returned to take over the reins. He completed 36 of 63 passes for 410 yards and three touchdowns with none intercepted. He moved on to the Dolphins for 1994 where he backed up QB Dan Marino for three years to finish out his career. 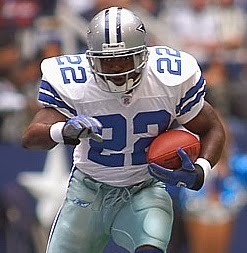 Emmitt Smith went on to win his third consecutive NFL rushing title, gaining 1486 yards on 283 carries (5.3 avg.) and scoring nine touchdowns. He also caught 57 passes for 414 yards and another score. The 86-yard reception against the Cardinals was the longest of his Hall of Fame career.